Vimeo Business and Premium members have exclusive access to a suite of video interaction tools, including email capture. 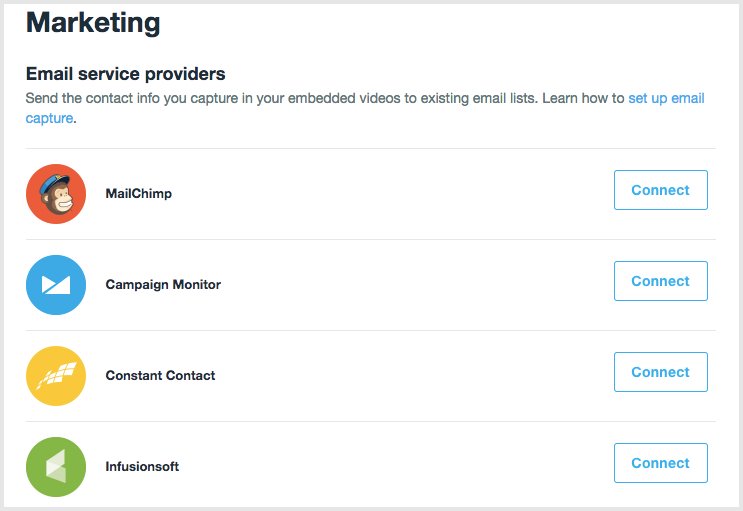 You can set up the email capture screen to appear before, during, or after your embedded videos, then either download those email addresses or sync them to your email service provider (e.g., MailChimp). If you're a Basic, Plus, or PRO member, you'll need to upgrade to Vimeo Business or Premium to unlock email capture in the embedded player. To enable email capture for one of your embedded videos, go to the Interaction tools tab in your video’s settings. From there, you can choose to enable email capture before, during, or after your video. If you choose to display the email capture screen before or during your video, you have the option to allow or prevent viewers from skipping the email capture screen. You also have the option to add a custom message, up to 100 characters in length, that will display along with the email capture fields. You can only set up one email capture screen per video. For example, if you’ve already chosen to display the email capture screen before your video, you’ll no longer see the options to display it during or after in your Embed settings. In compliance with their policies, email capture is not supported on Facebook or Twitter. From the stats panel for your video, you can check the number of times the email capture screen has been seen and the number of email addresses submitted for the past 30 days. Learn more about stats for video interaction tools here. On the Marketing tab of your Account Settings, you can download a CSV of all the emails captured through your embedded videos. The CSV contains the name (if provided), video ID, domain, and date captured associated with each email address. I will only use collected email addresses for marketing purposes. I will not share these email addresses with others. I will comply with CAN-SPAM, CASL, and any other applicable laws. I will provide an unsubscribe mechanism and comply promptly with opt-out requests. Once you accept, the CSV will download to your device. You can automatically sync captured emails with your email service provider (ESP) by connecting it to your Vimeo account. After accepting the terms, you’ll see a pop-up window where you can log in to your email service provider. Once you’ve successfully logged in, select the list (or tag, in the case of Infusionsoft) where you want the emails captured by Vimeo to be sent, and then click the “Sync” button. Your email service provider is now connected! The Marketing tab of your Account Settings should display the name of the list synced with Vimeo. To disconnect your email service provider from Vimeo, hover over the green “Connected” button and click to disconnect.